In recent months, Americans have become somewhat more confident that election officials are taking the steps necessary to guard against “computer hacking” in the upcoming election. At the same time, likely voters have become no more (or less) confident that their votes will be counted as intended this coming November. These findings are based on answers to questions posed to a representative national sample of 1,000 adults by YouGov last weekend. The research was supported by a grant from NEO Philanthropy, which bears no responsibility for the results or analysis. 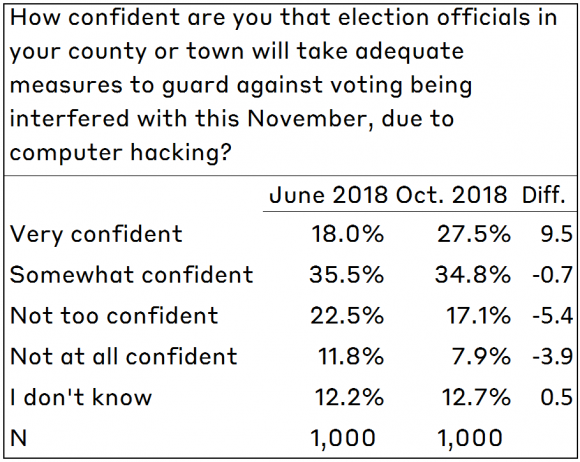 These questions, about computer hacking and overall voter confidence, were identical to ones asked last spring. The results suggest that despite a fairly steady stream of negative journalistic reports and opinion pieces implying that election officials are unprepared for the November election (like here, here, and here), the public’s overall evaluations have remained steady, and certainly haven’t gotten worse. 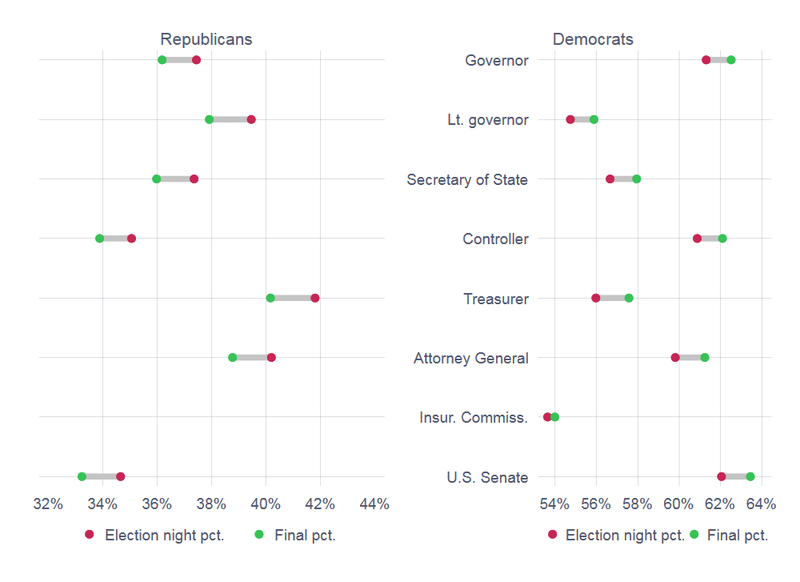 A deeper dive into the data show many of the same traces of partisanship that are now common in attitudes about election administration. For instance, Republicans are more confident about the upcoming election, both from a cybersecurity and general perspective. How confident are you that election officials in your county or town will take adequate measures to guard against voting being interfered with this November, due to computer hacking? Overall, 27.5% responded “very confident” and 34.8% responded “somewhat confident.” This compares to answers from last June, when the corresponding figures were 18.0% and 35.5%. On net, the 9.5-point increase in the “very confident” response came in roughly equal portions from the two “not confident” categories. Of course, because we don’t have a panel of respondents, just two cross-sections, it’s impossible to know how much individual opinion shifted over the five months. Still, it is clear that the net opinion shift is in a positive direction. Who shifted the most? Only one demographic category really stands out upon closer inspection when we examine the change: party. 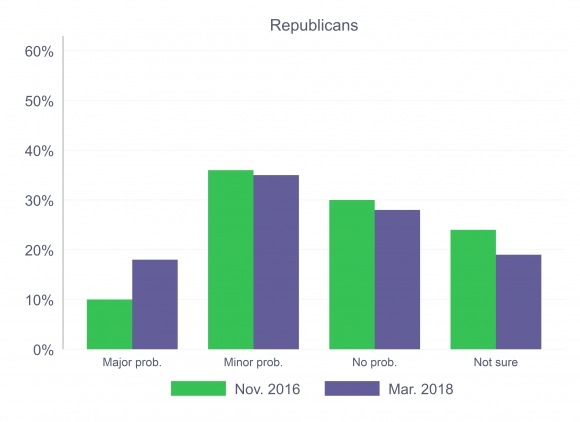 Although confidence in protecting against election hacking rose among all party groups, the rise in the “very confident” response was greater among Republicans than among Democrats. Independents also became more confident, but they were still more subdued than partisans. One demographic had an interesting effect in the cross-section, but not in the time series: interest in the news. In both June and in October, respondents who reported that they followed news and public affairs “most of the time” were more confident that election hacking would be fended off at the local level than those who followed the news less often. 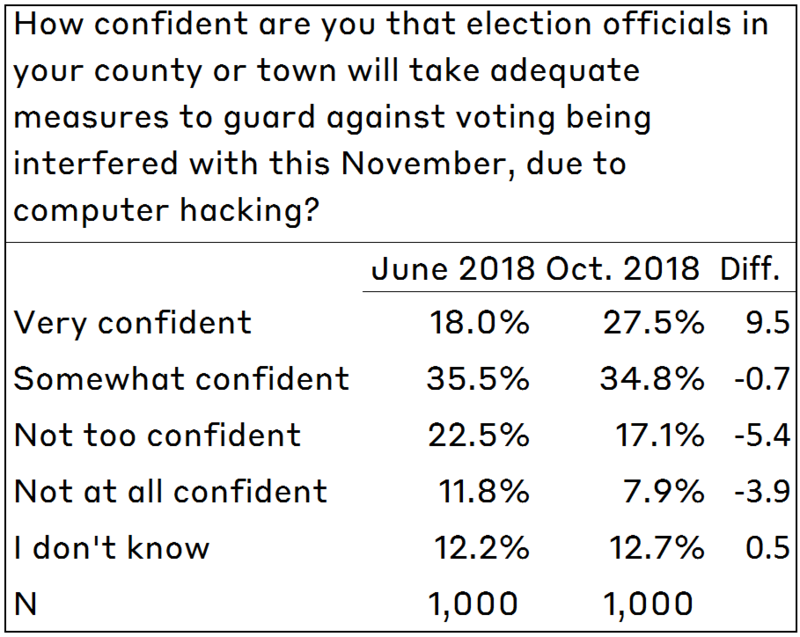 For instance, in June, 70.9% of Republican respondents who reported they followed the new and politics “most of the time” were either “very” or “somewhat” confident that local officials were prepared to fend off hacking in the upcoming election. Republicans not so engaged in political news were less likely to report confidence, at 58.9%. The comparable percentages for Independents were 54.5% and 35.2%, and for Democrats they were 53.5% and 49.0%. Before moving on to voter confidence more generally, I want to address one question that I know some people are asking themselves: What is meant by “computer hacking” in the upcoming election? In March, I wrote about what election hacking means to voters. You can read that post here. I wrote back then that Republicans were more likely to define the general phrase “election hacking” in terms of domestic actors committing fraud of some sort, while Democrats were more likely to define it in terms of foreigners messing with our elections. Assuming that this differential framing of the issue remains true today, we can imagine that the more sanguine view about computer security in the upcoming election means different things to the two sets of partisans. It is likely that Republicans are becoming more convinced that state and local election officials have traditional election administration under control for the upcoming election. Democrats, on the other hand, have most likely become slightly more convinced that election officials will be effective in fending off foreign intrusions. Let’s see what they think when the election is over. 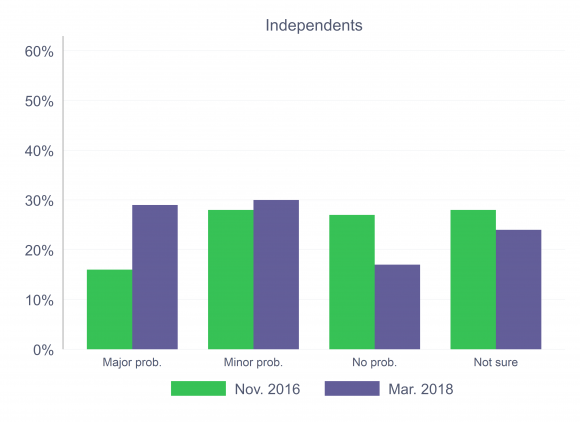 The slight improvement in confidence about preparations to defend elections against cyber-attacks is in contrast with the lack of change in attitudes about overall voter confidence. How confident are you that votes nationwide will be counted as intended in the 2018 general election? How confident are you that your vote in the general election will be counted as you intended? These are commonly asked questions. Others have asked them recently, such as the NPR/Marist poll in September. Here, I take advantage of the fact that I regularly ask the question in the same way, using the same method, to see whether there have been any shifts as the election approaches. There has been virtually no change in overall responses to either question since May, the last time I asked this question. 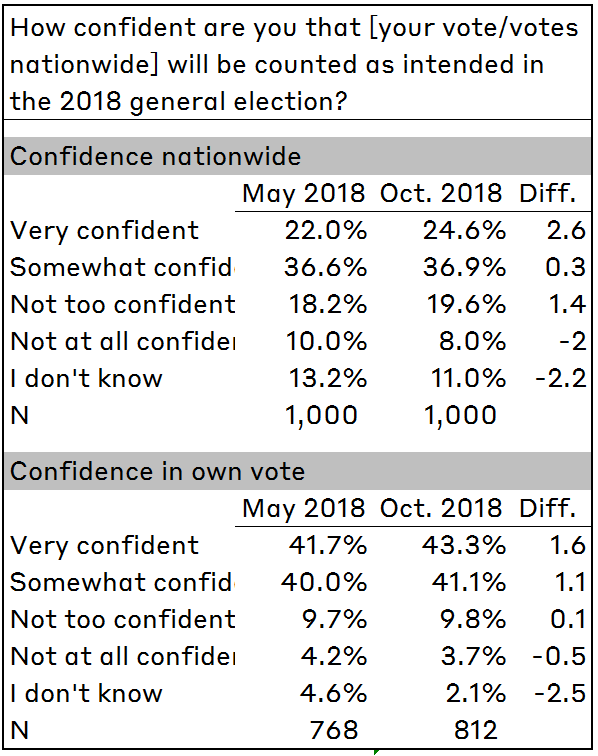 In May, 58.6% gave either a “very” or “somewhat” confident answer to the nationwide question, compared to 60.5% in October. The comparable percentages for confidence in one’s own vote were 81.7% and 84.4%. The changes across the five months are not large enough to conclude that anything has changed. Drilling down more deeply into partisanship, we also see few changes that distinguish the parties. Republicans gave more confident responses to both questions, but both parties’ partisans were virtually unchanged since May. There is now a considerable literature on the tendency of survey respondents to express confidence in the overall quality of the vote count, either in prospect or in retrospect. The findings I report here, therefore, are not path-breaking. They do stand in contrast to attitudes about a newly prominent piece of election administration, computer security. That piece is new to most Americans, and they are still getting their bearings when it comes to assessing the difference between hyped alarm and serious worry in the field. It will be interesting to see how all this plays out in the next month, and in the weeks to follow. Doug Chapin would, of course, say it more simpy: stay tuned. This entry was posted in Uncategorized on October 10, 2018 by cstewart. 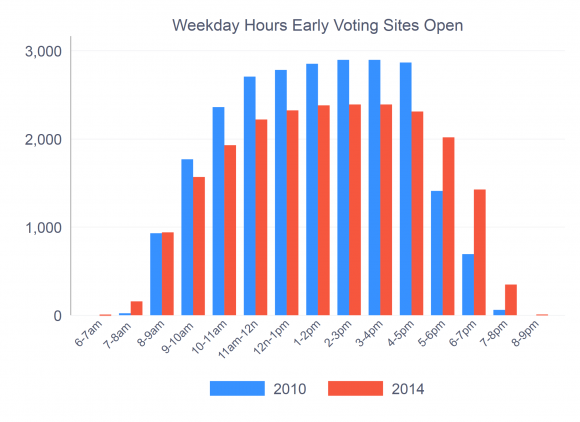 Blast from the Past: How Early Voting Can Serve as an Early Warning about Voting Problems. First, the setting: The 2006 Florida 13th congressional district race was, at the time, the most expensive congressional election in American history. It pitted Republican Vern Buchanan against the Democrat Christine Jennings. 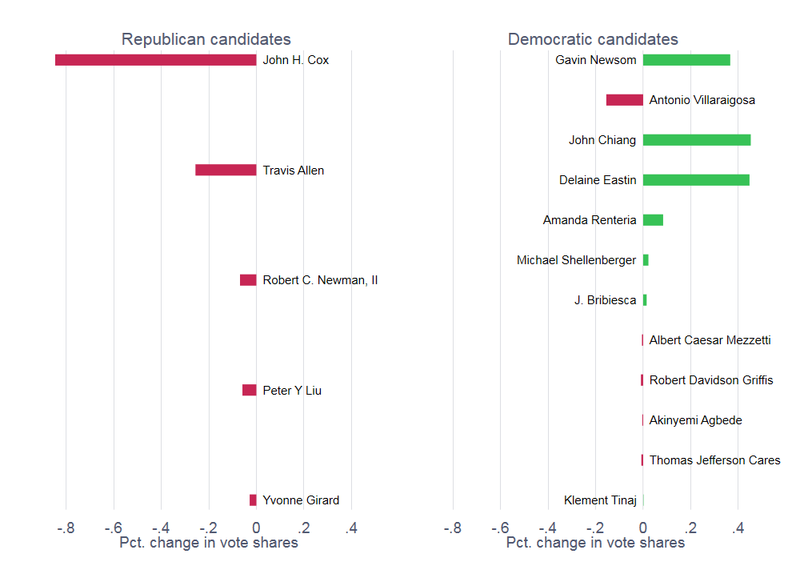 Buchanan was eventually declared winner by 369 votes, out of over 238,000 cast for the candidates. What drew this election to national attention was the undervote rate for this race and, in particular, the undervote rate in Sarasota County, where Jennings had her strongest support. In Sarasota County, 12.9% of the ballots were blank for the 13th CD race. In the rest of the district, the undervote rate was 2.5%. In the end, it was estimated that the number of “lost votes” in Sarasota County was between 13,209 and 14,739. Because the excessive undervotes were in precincts that disproportionately favored Jennings, it was clear that the excess undervotes in Sarasota County caused Buchanan’s victory. Here’s another piece of background, which gets us closer to the Becker/Gronke exchange: Part of the evidence that there was something wrong with the voting machines, and not just Sarasota County voters choosing to abstain, was that the undervote rate in early voting and on Election Day was much greater than the absentee voting in that county. This is important because early voting and Election Day voting were conducted on paperless iVotronic machines, whereas absentee voting was conducted on scanned paper. The absentee undervote rate in Sarasota County was 2.5%, which was close to that of Charlotte County (3.1%), which was also in the district. The early voting undervote rate was 17.6%, compared to 2.3% in Charlotte; the Election Day undervote rate was 13.9%, compared to Charlotte’s 2.4%. Here’s the factiod from this case that the Becker/Gronke exchange brought to mind. Note the difference in the undervote rate in Sarasota County between early voting (17.6%) and Election Day (13.9%). The Election Day rate wasn’t dramatically lower than the early voting rate, but it was lower, and probably not by chance. During the early voting period, voters complained to poll workers and the county election office that (1) they hadn’t seen the Jennings/Buchanan race on the computer screen and (2) they had had a hard time getting their vote to register for the correct candidate when they did see the race on the screen. This led the county to instruct precinct poll workers on Election Day to remind voters of the Jennings/Buchanan race, and to be careful in making their selections on the touchscreen. Of course, the fact that the undervote rate on Election Day didn’t get back down to the 2%-3% range points out the limitations of such verbal warnings. And, I know that Jennings supporters believed that the county’s response was inadequate. But, the big point here is that this is one good example of how early voting can serve as a type of rehearsal for Election Day, and how election officials can diagnose major unanticipated problems with the ballots or equipment. It’s happened before. 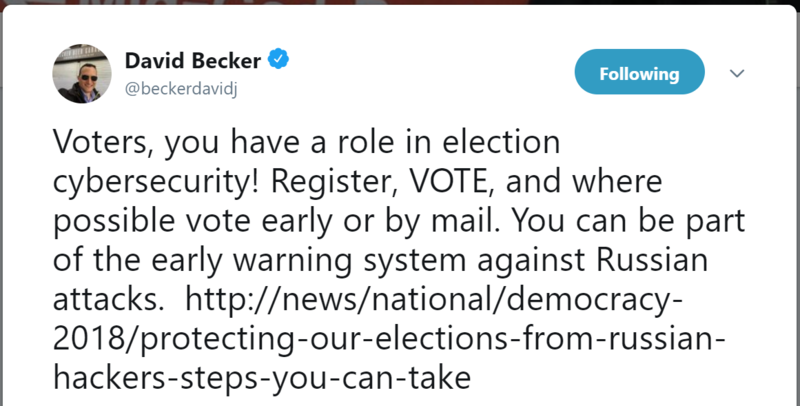 Thus, I agree with David Becker, that early voting can definitely help election officials gain early warning about problems with their equipment, systems, or procedures. I would amend the point — and I think he would agree — that this is true even if we’re not concerned about cybersecurity. Preparing for elections requires that millions of small details get done correctly, and early voting can provide confirmation that the preparations are in order. I don’t know of evidence that absentee voting serves as quite the same type of early-warning system, but it makes intuitive sense, and I would love to hear examples. Two final cautionary thoughts about the “early voting as early warning idea,” as attractive an idea as it is. First, I’m not convinced that many, or even any, voters will vote early because they want to help shake-out the system. 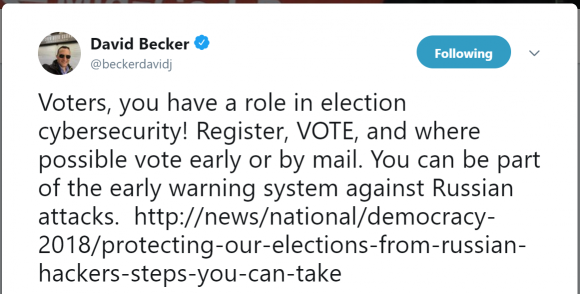 Indeed, there’s the possibility that if a voter believes there are vulnerabilities that will only become visible during early voting, but that are likely to be fixed by Election Day, it would drive them to wait until Election Day. Let other people shake out the system and risk discovering that something needs to be tweaked or fixed. A bad guy trying to disrupt the election will probably not want to tip his hand until as late as possible, to have maximal effect. 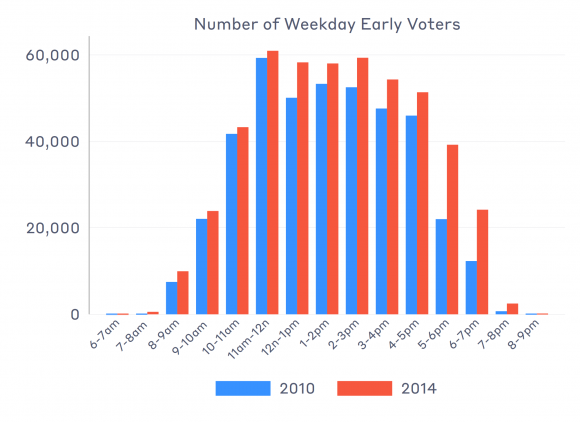 Thus, “early voting as early warning” is probably most effective as a strategy to ensure against major problems on Election Day that occur due to honest mistakes or unanticipated events. I don’t know if “early voting as early warning” is the best justification for voting early, but it’s not a bad one, either. It’s probably best at sussing out mistakes, and probably will be of limited use in uncovering attacks intended to hurt Election Day. But, that’s OK. I continue to be convinced that if any voter is going to run into a roadblock in 2018 in getting her vote counted as intended, it will probably be because of a problem related to good, old-fashioned election administration. The need to ensure that the blocking-and-tackling of election administration is properly attended to is reason enough for me to learn about the system from early voting. This entry was posted in Uncategorized on August 10, 2018 by cstewart. The annual State Certification Testing of Voting Systems National Conference was recently held in Raleigh, North Carolina. This is one of my favorite annual meetings, because it brings together state and local officials who are responsible for the care and feeding of voting technologies. I learn a lot every year. Check out the program, including slides and other documents, here. The price of attending is that every participant must give a presentation. This gave me an opportunity this year to pull together work I have done over the past several years about public opinion related to voting technology and election security. This is the first in a series of blogs in which I share some of the material I presented in Raleigh. 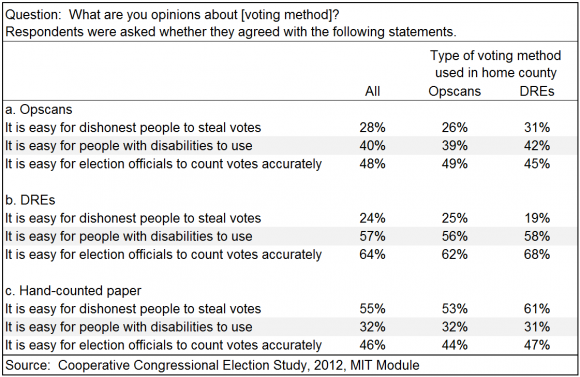 Today’s post is about attitudes toward voting machines. The current nationwide attention to election security has led to a renewed interest in voting technologies and to two topics in particular: (1) the use of computers to cast and count ballots and (2) the age of the equipment and the need to replace machines that were bought in the aftermath of the 2000 election. Beginning in 2012 I started asking respondents to public opinion surveys what they think about different voting technologies. Not surprisingly, opinions among the public about voting machines have changed in recent years, particularly as the drumbeat against DREs has grown louder, and as the security of voting technologies has become more salient. To see how opinion has changed in the recent past, it is useful to start in 2012, when I first asked a series of questions about voting machines in the Cooperative Congressional Election Study (CCES). Especially interesting are attitudes of respondents based on the voting equipment used in their home county. The table above shows how this breaks down. Respondents from counties that used DREs preferred them over opscans, 74%-13%. Surprisingly, respondents from opscan counties also preferred DREs, by a comfortable 50%-30% edge. Lying behind the overall preference for DREs over opscans — and the strong preference for either of these technologies compared to hand-counted paper — was a belief in the functional superiority of DREs, especially to count ballots and for usability. To probe these deeper attitudes about voting machines, I asked respondents what they thought about the three major types of voting technologies. In particular, I asked whether the respondent thought it was easy (1) for dishonest people to steal votes, (2) for disabled voters to use, and (3) for election officials to count votes accurately. As the table below shows, on the whole, DREs won out over opscans — they were virtually tied on the question of vote-stealing, whereas DREs won hands-down on usability and counting accuracy. Both opscans and DREs won out over hand-counted paper. Probably the most interesting results come in analyzing respondents based on the type of voting technology used in their communities. Here, we find surprisingly little difference between users of opscans and DREs. For instance, 26% of opscan users thought it was easy to steal votes using opscans, compared to 31% of DRE users. Most importantly, in 2012, even users of opscans believed that DREs were easier to use by voters with disabilities, and were easier for election officials to count votes accurately. Opinions have changed since 2012. Support for DREs has fallen since 2012 while support for opscans has risen. (See the accompanying figure. Click on it to enbiggen.) A particularly sharp drop in support for DREs occurred in just one year, from 2016 to 2017. 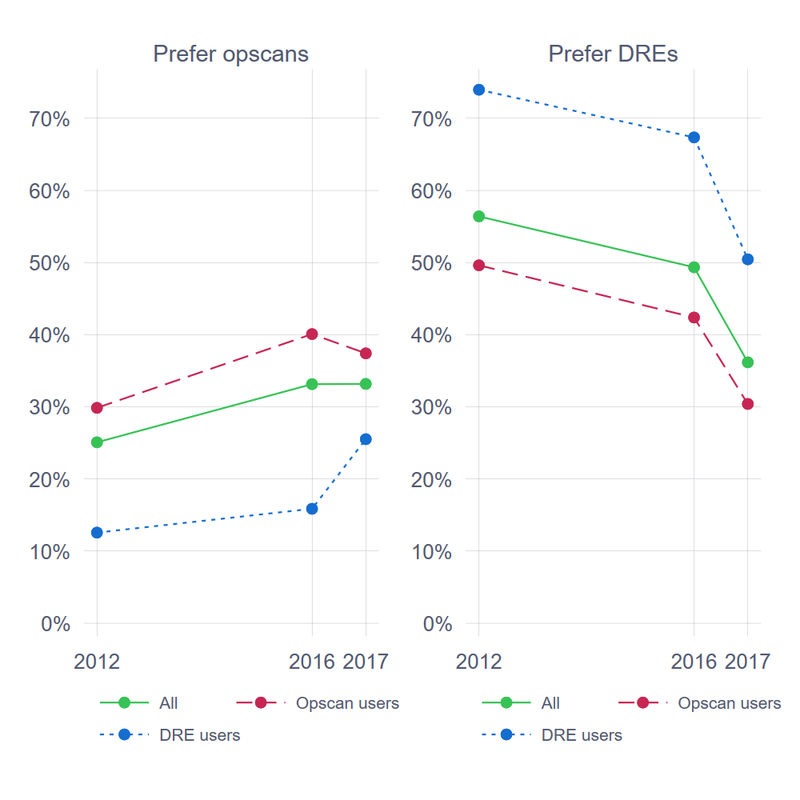 As of last fall, DREs no longer had a commanding lead over opscans among respondents overall, and opscan users no longer prefer DREs over opscans. The perceived functional superiority of DREs is disappearing. This is illustrated in the figure below, which shows the percentage of people who believe it is easy to steal votes and to count votes, on opscans, DREs, and hand-counted paper. (Click on the image to largify it.) 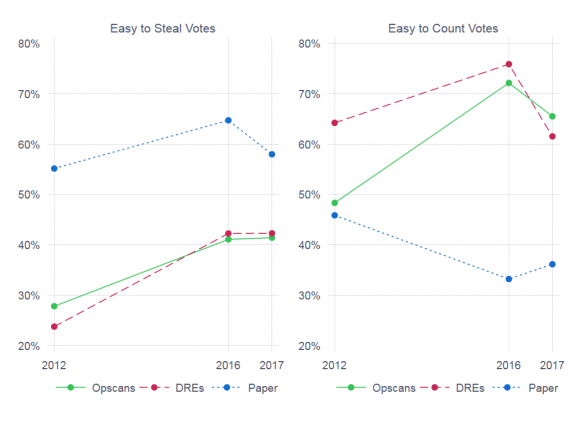 There was a significant increase in the belief that it was easy to steal votes on all voting technologies between 2012 and 2016, but the increase was slightly greater for DREs than for opscans. There was also a significant increase in the belief that it was easy to count votes on both opscans and DREs (but not hand-counted paper) between 2012 and 2016, with some pulling back from those positions in 2017. Whether we take the 2016 or 2017 numbers, however, it is clear that DREs no longer are the clear winners on the vote-counting dimension. Thus, as criticism of DREs has grown in public discourse, and computer security has become a more salient issue in election administration, the bloom has come off the DRE rose. This is good news for those who have long advocated that DREs be abandoned for paper. There is a caution here, however. 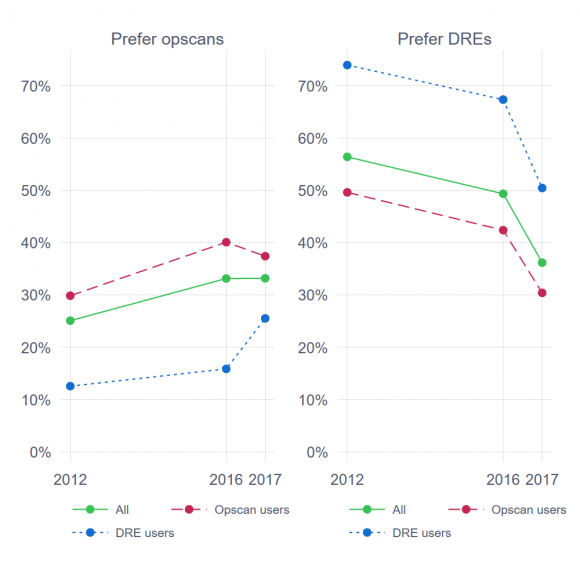 Although support for DREs has declined significantly over the past five years, DRE users still believe it is the superior technology compared to opscans. This suggests that as election administrators transition away from DREs over the next several years, they may find themselves needing to deal with local public opinion that may be skeptical of the move, and regard opscans as an inferior technology. This entry was posted in Uncategorized on June 26, 2018 by cstewart. What does “election hacking” mean to the public? Yesterday I wrote about a recent poll I conducted that revisited the question of whether voters thought computer hacking was a major problem in the November 2016 election. That post noted that more Americans have come to believe computer hacking was a major problem in 2016 than they believed back then. However, the majority of opinion change has come from Democrats. You can read that post here. There has been talk in the news recently about computer hacking in American elections. When someone talks about hacking American elections as a general matter, which of the following do you think about first? The following table shows the possible response categories and how they were distributed among the respondents. A plurality of respondents chose one of the two options involving foreign actors, whether using social media to influence voters (20%) or breaking into the computers that run elections (25%). A good number of people, 20%, said that “nothing in particular” came to mind when they hear talk of computer hacking in elections. Table 1. Question: When someone talks about hacking American elections as a general matter, which of the following do you think about first? 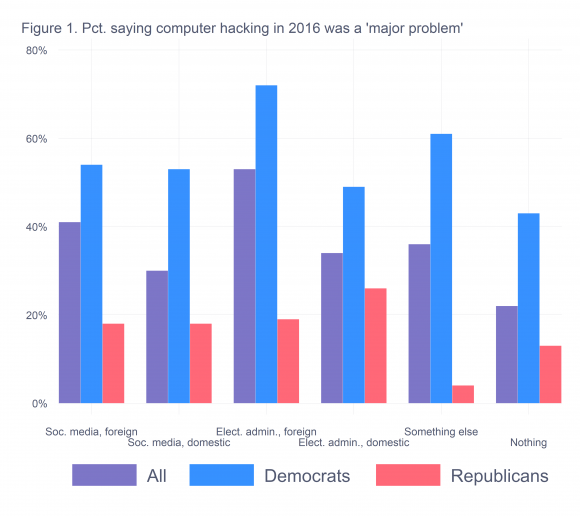 There is a partisan divide in how respondents think about the topic of election computer hacking, but the pattern is more complicated than Democrats simply thinking there’s a big problem and Republicans not. A majority of Democrats chose one of the two responses that focus on foreigners, compared to only 39% of Republicans. However, Republicans were much more likely to choose the response about Americans breaking into election equipment. Like I said, the partisan divide on this question is not straightforward. It’s hard to know what’s going on here, with only one question in a limited survey. However, my favorite hypothesis is that this is evidence that Democrats are focused on the “Russian hacking” narrative about the 2016 election, whereas Republicans, when they think about problems associated with the election, are drawn toward corruption of election administration itself. My guess is that had I asked respondents which was the bigger election administration problem, breaking into voting equipment by foreigners or inside corruption of the process, the parties would have neatly divided on the question — but, that’s a question to explore in the future. To put yesterday’s and today’s posts together, it is interesting to note that there is a link between first thoughts concerning election hacking and the degree to which one thinks that computer hacking was a major problem in 2016. Respondents saying that foreign hacking of computers used in election administration was the first thing that came to their minds were the most likely to say that computer hacking was a major problem in 2016. (See the figure below. * Click on the figure to enlargify.) This was especially true among Democrats, and only somewhat true among Republicans. I concluded yesterday’s post by suggesting that Democratic and Republican constituents were likely to exert different levels of pressure on their parties’ legislators to do something about computer security in elections. Today’s post suggests an amendment to that conclusion. In particular, the Democratic mass public seems convinced that (1) computer security in elections is a big problem, (2) the problem comes from outside the country, but (3) they can’t choose whether social media manipulation or voting machine hacking is a bigger problem. In other words, security is a problem, and we’re being attacked from abroad. The Republican mass public is not convinced that computer hacking of elections is a major problem; to the degree it might be a problem, they are more conflicted over whether it’s a domestic or foreign threat. As is often the case in politics, it’s the side that has a clear diagnosis of a problem and its solution that drives the debate. In that case, it’s the Democrats. Of course, they don’t have the majority, at least in the nation’s capital, which may be a prescription for a lot of talk, and not a lot of action, from our national legislators. *The figure originally had an error in how the x-axis categories were labeled. It has been corrected. This entry was posted in Uncategorized on March 8, 2018 by cstewart. Today starts a regular feature of the MIT Election Data and Science Lab called “Special Election Watch.” The idea is to follow special elections in 2018 as a guide to the extent of the Democratic swing in the November 2018 election. First, a couple of words of background, and then a guide to the graph we will be updating regularly. 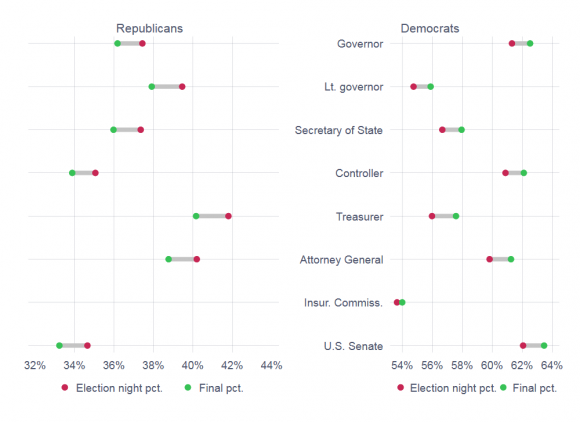 Political scientists have long followed the partisan “swing” from one election to the other. Analysis of the “uniform national swing” has been a staple of discussing British politics going back to the 1940s. The question of whether the swing is so uniform in the U.S. has a distinguished pedigree, perhaps most notably represented by a small book by Tom Mann, Unsafe at Any Margin, in 1979 and an article by Gary Jacobson, “The Marginals Never Vanished” in 1988. Despite the fact that the partisan swing of electoral fortunes varies across districts in a particular election, the average swing across districts is a good starting point for gauging the degree to which one of the political parties will be favored. Which brings us to the special election watch. It’s widely accepted that 2018 will be a good electoral year for the Democrats. But, by how much? 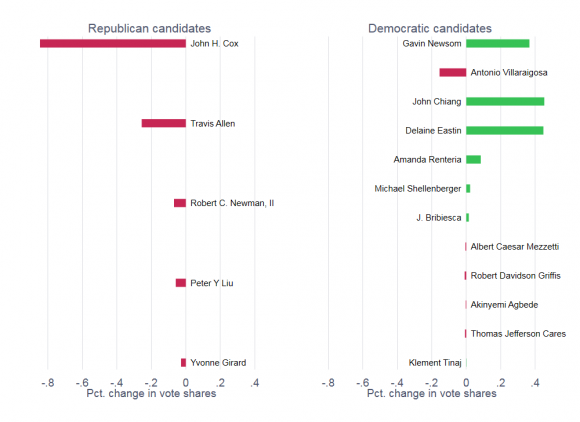 One common measure is the so-called generic congressional poll. Another way to measure relative electoral strength is to calculate the change in electoral fortunes of the parties as they defend legislative seats in special elections. That’s the approach we’ll be following here. Here’s the guide to how to read the graph. Each row represents a state legislative special election, with the district indicated on the left and the date of the election on the right. The code for the district is the postal state code + “H” for House or “S” for Senate + district number. The circle represents the percentage of the vote received by the Republican candidate in the last regular election; it’s red if the Republican won and blue if the Democrat won. The arrow points to the Republican percentage in the special election; the arrow is red if the Republican won the special election and blue if the Democrat won. At the very bottom, we show the average. As of last Tuesday, taking all the special elections into account, the average swing has been about 16 points in favor of Democratic candidates. Of course, there is more to this graph than just the average. For instance, a large number of these seats were originally won without a contest. Indeed, of the 15 elections shown here, 8 were originally won without a contest, 6 by Republicans and 2 by Democrats. Not surprisingly, the average pro-Democratic swing was greatest in the previously uncontested seats (27 points) than in the seats that had been contested (4 points). About half of all state legislative races were uncontested in 2016. If the patterns in the special elections hold in the general elections, we can expect a sharp drop in uncontested elections at the state level, which will be a significant event in itself. This past week, there has been considerable press coverage of the special election in the 97th Missouri House district, which flipped to the Democratic column after it had given Donald Trump a large majority in 2016. While seat-flipping is certainly notable, the larger story was the overall mobilization of Democratic voters in the four Missouri districts that had special elections on the same day. Two of the districts (the 39th and 144th) had gone uncontested in 2016. The fact that these districts attracted strong Democratic candidates, one of whom came close to winning, is almost as important as the Democratic victory in the 97th, at least from the perspective of measuring the relative appeal of the two parties’ legislative candidates these days. The 2018 election year is just starting. It’s a long way to November. 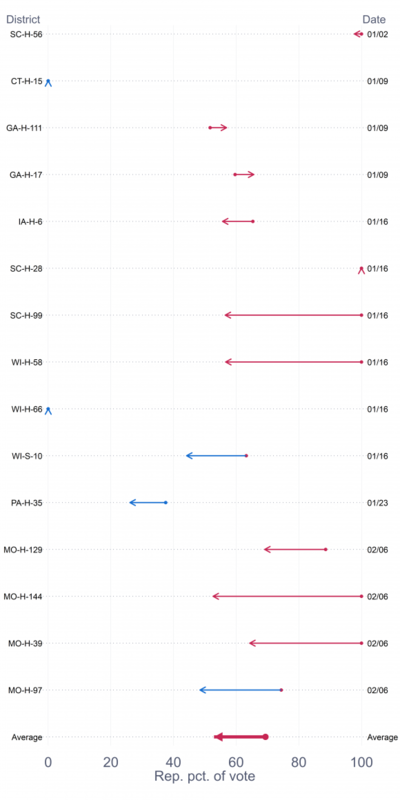 However, as Gary Jacobson and Sam Kernell taught us in their classic book, Strategy and Choice in Congressional Elections, the most important events of a congressional election year happen at the beginning, when the candidates, parties, and potential backers size up the field. So far, the elections that are currently being held are consistent with even more good Democratic candidates jumping in and even more good Republicans staying (or moving to) the sidelines. This entry was posted in Uncategorized on February 8, 2018 by cstewart. This is the fourth of a four-part series looking at public attitudes related to President Trump’s fraud commission. 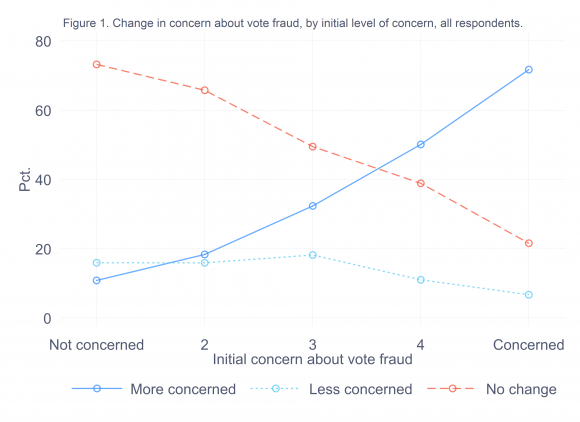 Part I introduced the series and explored whether voters had become more concerned about vote fraud since late 2016. Part II explored who was knowledgeable about the commission. Part III examined public opinion about the termination of the commission. Today, I look at messaging about voter fraud, and then offer up some summary thoughts about the work of the commission, its termination, and the future. The value of a presidential commission is that it draws attention to an issue and can serve as a focal point as public opinion is mobilized for policy change. Both ardent supporters and opponents of the Presidential Commission on Election Integrity saw the commission as filling this role in the case of vote fraud and voter registration. Because the most prominent member of the commission, Kansas Secretary of State Kris Kobach, has developed a reputation as a determined opponent of voter fraud, it was reasonable to expect that had the commission continued conducting business, it would have been an amplifier of claims about the high prevalence of voter fraud in the U.S. The commission never served this function, both because of its premature demise and because the news surrounding the commission was muddied by its controversy. However, let’s consider the counterfactual. What if the commission had not been terminated, and what if Kobach’s message about high rates of fraud had been given clear expression? What would the effects of this messaging be? A plurality of respondents (47%) said they were unmoved by the statement they were shown, 40% said it made them more concerned about fraud, and 13% said they were less concerned. (See Table 1.) Most Democrats said their views were unchanged; most Republicans said they were more concerned. Table 1. Question: Does [the statement you were just shown] make you more or less concerned about voter fraud? Thus, the respondents processed claims about voter fraud through the lens of partisanship. This is consistent with much of the modern research into the effects of persuasive communicates, which generally teaches us that people readily internalize information that confirms prior beliefs and reject information that is dis-confirming. This process is typically the most potent among the most politically engaged, who are the most aware about “what goes with what,” that is, most aware of the positions associated with the two parties. And, true enough, that pattern shows up here, as well. 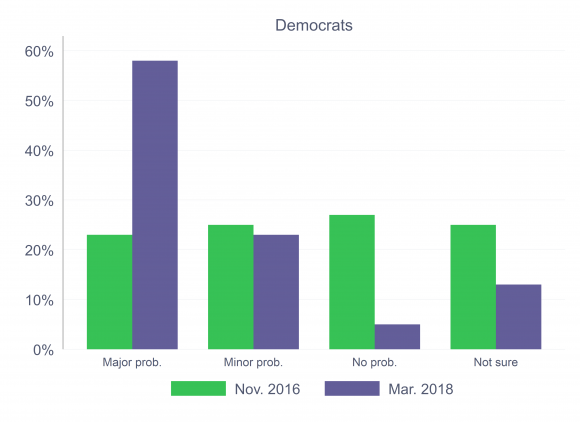 For instance, while 55% of Democrats stated that the statement they read about voter fraud did not change their concerns about fraud, 72% of the “hyper-aware” Democrats said they were unmoved. (Recall, the “hyper-aware” respondents were those who both (1) closely followed news about the commission and (2) could pick out Kobach as a member of the commission.) Among hyper-aware Republicans, 61% said they were even more concerned about fraud after reading the statement, compared to 55% of Republicans overall. In other words, among the most engaged partisans, being presented with a claim about voter fraud just pushed them further apart from each other. A similar pattern also emerges when we examine the responses to these statements in light of how concerned the respondents said they were about vote fraud at the start of the survey. (See Figure 1). Among those who initially said they were the least concerned about vote fraud, 73% said that the statement they read about fraud didn’t change their mind. Among those who initially identified themselves as being the most concerned about fraud, 72% said the statement made them even more concerned. As an aside, the pattern in Figure 1 persists among all levels of attention to the commission, or even all levels of attention to politics in general. 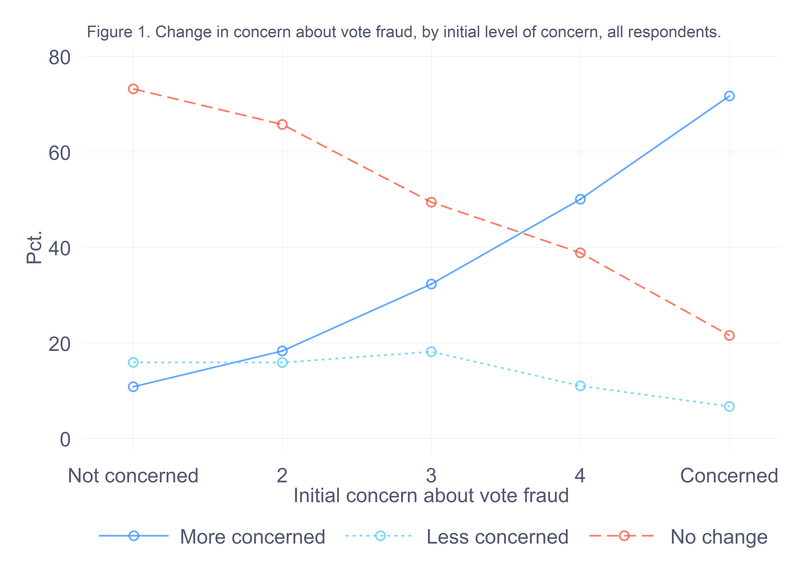 What this means is that attitudes about vote fraud are probably already pretty entrenched among citizens, and that claims about fraud have little-to-no influence on those attitudes, at least in the short run. Among the four statements, which had the greatest effect on concerns about fraud? Table 2 provides the answer to the question. What stands out here is the fact that the last two comments tended to elicit more expressions of additional concern than the first two. Figuring out why this is requires some speculation, because each of the items mixes and matches stimuli. Still, it strikes me that the last two items pertain to specific types of voter fraud (non-citizen voting and double voting), whereas the first two items refer to fraud in general terms. It is possible that specific cases of fraud are more compelling than the general problem of fraud. Or, it is possible that non-citizen and double voting in particular are especially compelling ways to frame the fraud question. In any event, I am sure that others who are more expert in the field of persuasive communications than I am will be exploring this question further. This has been a fast-and-furious tour of the new survey data about the Trump fraud commission and its termination. I hope to be writing more about this in the weeks and months ahead. For now, it is important to note that support for the commission and its termination was not as firmly linked to partisan attitudes as attitudes about fraud itself. I have gone on record as saying that the termination of the commission only shifts the politics of vote fraud to other venues. It remains to be seen whether those venues will be seen as having greater authority than the commission, and thus (perhaps) greater influence on what the public believes about fraud. One reassuring message from the survey responses is that even Americans who were the most concerned about voter fraud were not up in arms about the commission’s termination. This suggests an opening for bipartisan endeavors to secure the voting rolls that may be effective with the broad middle of public opinion. There are already effective models of such efforts, ranging from states that carefully adhere to the NVRA, to the Electronic Registration Information Center. Efforts such as these are likely to be more effective in securing voter registration lists while maintaining access to the ballot box than promoting messages that polarize attitudes further than they already are. This entry was posted in Uncategorized on February 6, 2018 by cstewart.